An Iranian pilot recently became the first casualty of Iran's intervention into the Iraq crisis. What do we know about this intervention and Tehran's motives for intervening in Iraq? 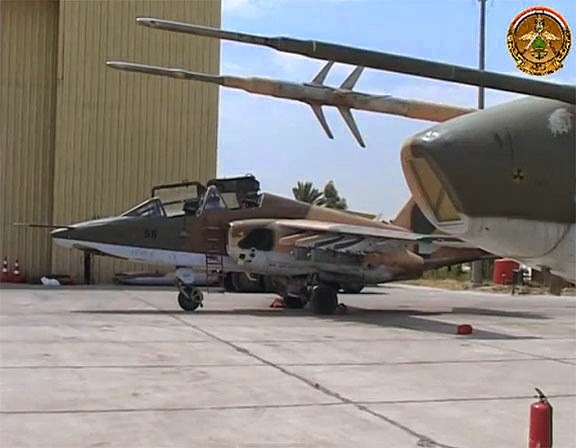 Former IRGC Su-25's in Iraqi Air Force. The Islamic State (formerly of course the Islamic State of Iraq and the Levant) group rampaged through, and destabilized, Iraq after its takeover of Mosul last month and the embarrassingly rapid retreat of the Iraqi Army ahead of those advances. Images of these Islamists flaunting abandoned Iraqi Army hardware was a very embarrassing sight for Americans given the amount of blood spilled and money spent for a strong and stable post-Saddam Iraq. The American public for the most part doesn't want to go back into Iraq bar the present dispatch of some unmanned aerial drones and a token ground force to protect American citizens in Iraq. Whether U.S involvement in Iraq will increase in the near future has yet to be seen. For now however in the vacuum left by the American withdrawal of late 2011 Iran is now undergoing a direct, albeit limited, intervention to confront the threat to the Iraqi state being posed by the Islamic State. It has recently suffered its first casualty in this campaign a few days ago, a pilot who was part of the Iranian military which have entered Iraq to engage these Islamic State forces. Whilst there is a lot of speculation about how far Iran will go in its intervention in Iraq or whether or not it will exploit the present crisis to solidify its strategic regional alliance vis-á-vis a friendly government in Baghdad and the Assad regime in Damascus. However casting aside the interests of the regime in Tehran momentarily one must recognize the understandable interests Iran has in intervening in Iraq and combating the threat posed by the Islamic State. This is after all a very violent group which espouses rhetoric that deems the Shiites heretics who are much worse in their eyes than Christians or Jews given their diverging views from the Sunni branch of the Islamic monotheism. One need only take a cursory look at the statements of such extremist Sunni groups to hear them refer to Iran along with the current Maliki government in Baghdad (which has been rightfully called out for its sectarian attitude and its unproductive marginalization of Sunni and Kurdish minorities in the political process) as a Safavid force, a clear and direct reference to the dynasty that ruled Iran from the 1500's to the 1700's and promulgated the Shia branch of Islam. And not only that it is a violent group that is gaining traction in Iran's neighbour. And it has threatened to spread. It has threatened the Kingdom of Jordan. Threats which have led Israel to declare it will help Jordan to defend itself in case of an attack or incursion into the kingdom by Islamic State fighters. Israel for obvious reasons would not tolerate a scenario whereby such a group is able to gain ground in a neighbouring state. Ground which could potentially be utilized as a launching pad for terrorist attacks against Israelis. Just as captured Iraqi territory could be used to infiltrate Iran and terrorize its citizens. Similar perhaps to how the extremist Sunnite Islamist Jundallah group has done in the past. Nevertheless the regime in Iran has shown how ruthless it can be when it comes to maintaining the regional order it has been building up since its inception in 1979. An order which includes, but is not limited to, a close strategic relationship with the Syrian regime which it has provided with billions to help it retain its hold on power which has been threatened since the present ongoing conflict there started in 2011. Whether we agree with Iran's policies in the wider Middle Eastern region it is essential that we understand them and even more importantly understand what it is that motivates them to see to the implementation of such policies. It does indeed arguably have a lot to do with power and influence, but it also has a lot to do with security. Iran's intervention against the Islamic State ravaging Iraq at present was certainly not unprecedented. It is what any leader in power in Tehran would likely have done if he was serious about Iran's security. This fundamental fact of the matter is what must be acknowledged when assessing Iran's influence in the region and figuring out ways to either confront it or accommodate and assimilate it into the regional order. Strategic regional alliances are formed for a purpose. On Assad, the whole idea was that a strong Assad’s Syria, backed by Hezbollah, would offer deterrence against any possible Israeli attack on Iran. After three years of civil war, Assad’s regime is a caricature of its older self, and for years, if not decades, it would not be in any position to offer a deterrence vis-a-vie Israel. The government in Baghdad is even in more precarious situation: it might not even have a country as we knew it. So solidifying those “strategic regional alliances,” might become more of liability than asset for Iran. The present conflict in Iraq is part of a historic struggle within Islam, and sectarian wars, Shia on Sunni, Sunni on Sunni and Shia on Shia sectarianism will inflame the region for years to come. Justifying Iranian intervention in Iraq in terms of security concerns and normal power politics misses the extreme danger of religious wars, especially for a country that represents the Shia minority in the Muslim world. So now according to Nader Iran should just fold its hand and do nothing when even Israel that have no common border with Iraq is worried and making arrangements on how to confront IS if it ever make an incursion into Jordan. Whoa! Probably it is my imagination and Nader intend no such thing. Nader pray tell what do you think Iran should be doing now that these terrorist groups are openly threatening Iran? Even the USA that is thousands of kilometres away from the middle east claimed that terrorism is a threat to its national security and is taking action to eradicate this threat. According to Nader a nation that invade other nations based on false pretense is engaged in normal power politics but a nation that is waging a war on an existential threat in her immediate neighbourhood should not be viewed as engaged in normal power politics. Take it or leave it Iran said Assad will not leave and Assad after 3 years of brutal imposed war is still in power, you just wait and watch what will happen in Iraq. Give credit where credit is due. The realities on the ground tell us that there is a fine line between fighting terrorists and getting sucked in a religious war. Iran needs to use its special forces combatting and containing terrorists, but the Quds Force should not be seen as a Shia foreign mercenary force fighting Sunnis. That would be a no-win situation. Time for sloganeering is not now, cooler heads need to prevail to stop the terrorists without inflaming sectarian violence. On your point about Assad and Iraq: The Assad "in power" these days is not same Assad which was part of a Shia resistance empire Iran so badly pushed to create. He does not have the power to beat the most disorganized opposition force, let alone act as a leader of "axis of resistance." the government in Baghdad is even in worse shape, might be left with not much of a country to govern. That idea of Shia resistance empire is crumbling. Iran needs to re-evaluate its policies and concentrates on terrorist threat of its homeland. Anon 7:11 PM, I agree with you, especially as opposite comments here are published at random will in order to justify a certain view this site is trying to impose on the developments in the region. Of course this continues there will be no difference between this site and all the other mainstream news sites which are increasingly losing popularity. Firstly, the Palestinians Hamas and Islamic Jihad are Sunni dominated resistance movement yet Iran provide them with more support politically, economically and militarily than the whole of the Sunnis dominated nations put together. Secondly, Syria Arab Army is 70 to 80 percent dominated by Sunnis yet it did not betrayed Assad by extension Iran and Iran at a great cost organised the NDF for Syria which consist of all the sectrian confession in Syria. These two nations that I used for my analogy are Sunni majority nations and in fact the Syria war is not an isolated case but directly related to the ISIS extremism in Iraq. Iran at a very high cost have always avoided the narrative of Shiite vs Sunni, remember when Iran embassy in Lebanon was bombed by terrorists Javad Zarif denied any involvement of Saudi Arabia in tye gruesome act when all indications pointed to the kingdom. Where did you get the idea about Shiite empire? You are parroting the same line as the western MSM, the IRI is a rational actor as confirmed by its arch enemies the US and Israel. The question is who stand to gain from these sectrian narratives especially if it takes root? We all know from reading the history of the middle east the nations that have always employ the tools of divide and conquer to attain their exploitative and inhuman agenda. Definitely not the IRI. I do understand the official line of the Islamic Republic. Unfortunately, the realties do not support the assertion that Iran is not after building a Shia militant fighting force in the region. If anything, the Quds Force is increasingly managing a Shia foreign mercenary force in Iraq and Syria; starting with Hezbollah and now all Shia militias fighting in Iraq and Syria. The actions of countries speak much louder than their propaganda. Talking about parroting some foreign country's MSM!